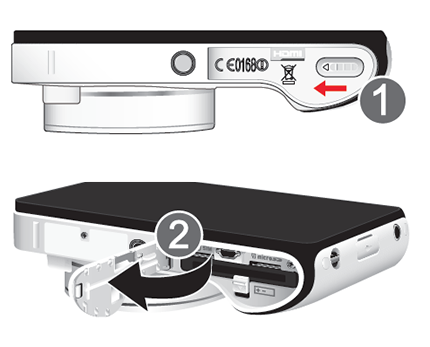 How Do I insert or remove the microSD card in my Samsung Galaxy Camera? 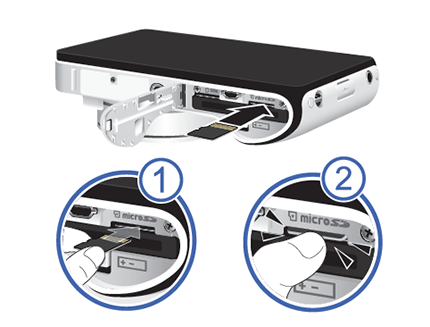 Your device lets you use a microSD™ (SD) or microSDHC™ card (up to 64GB) to expand available memory space. This secure digital card enables you to exchange images, music and data among SD-compatible devices. 1. To open the door on the bottom of the camera, slide the lock to the left (1) and swing the cover open (2). 2. Carefully slide the microSD card into the microSD card socket until the card clicks into place. NOTE: Make sure that the card's gold contacts face into the camera and that the angled corner of the card is positioned correctly. If the card is not inserted correctly, the camera will not detect the card. Reorient the card back into the slot if the card is not detected. 3. Close the door and slide the lock to the right to secure it in place (1). 1. You must first unmount the microSD™ card before removing it. Open the Notification Panel by swiping your finger from the top of the screen to the bottom, and touch Settings > Storage > Unmount SD card. Touch OK to finish unmounting the card. 2. To open the door on the bottom of the camera, slide the lock to the left and swing the cover open. 3. Press in on the microSD card to disengage the locking mechanism. You should hear it click. 4. Grasp the memory card and remove it from the device. 5. Close the door and slide the lock to the right to secure it in place. Which Location Settings(GPS) are available on my Samsung Galaxy Camera? Galaxy Camera: Which Location Settings(GPS) are available? Galaxy Camera: How Do I Format the microSD™ card?